If the new Särmä TST Clothing System snow anorak and trousers are too fancy for you no worries: that's why we offer these, made exactly like the Finnish Defence Forces issue model! 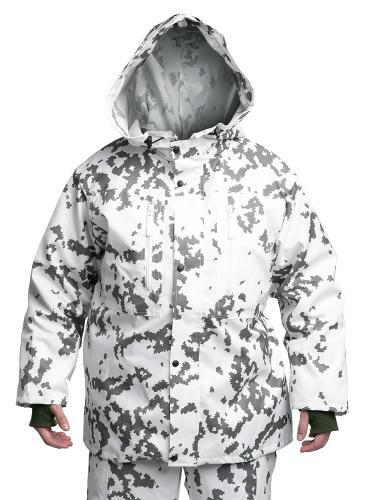 Two zippered chest pockets, a large hood and oversized fit are the main things about this snow camouflage jacket. 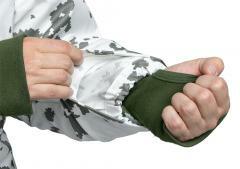 Can be worn alone or over the"normal" camouflage uniform. The fabric is 70/30 polyester/cotton, the exact same material used in the latest production runs of the official issue uniforms. Naturally the camo print is totally NIR compliant, so you don´t need to fear looking all lit-up when viewed through NVDs. The one thing we changed from the official military model is the sizing, the "names" of the sizes to be exact. Instead of the cryptic 754 etc. we have first and foremost marked these with easy "Large Regular" etc. sizes with the official Finnish military size number and user recommended measurements (height and chest circumference) in brackets. 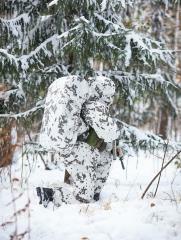 The snow camo suit is designed to be generously oversized to fit over thick cold weather clothing. Using waist and hem adjustments you can adjust the size for a custom fit. 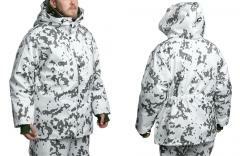 If you for some silly reason want a snug fitting snow suit just order a size smaller than you normally "should" wear. Excellent and well made, the pockets are VERY BIG and can hold a lot. The seams are multi-stitched which is great! The fine adjustments for size are reliable and easy to use. I am very happy with this and I can't wait for the big snow to try this out! 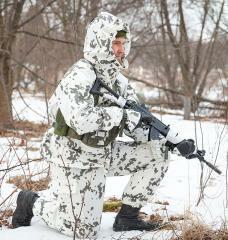 This is a VERY nice snow camouflage set (I got the trousers, too). Delivery time from Helsinki, Finland to Ohio, USA was only 6 days using the faster DHL Express shipping. Material is heavy weight and should last a lifetime. 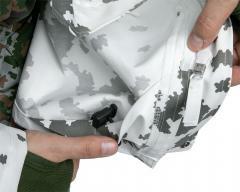 The stitching is precise, the hardware high quality and you can tell it is military spec gear. The sizing is VERY generous. I am a large guy at 193 cm and 114 kg; very fit. I ordered an 862-64 and probably could have gone down one size, but this is made to go over your parka so keep that in mind when you plan your end use. You would have to be VERY tall to need to go to a 9. There is an elastic band across the waist, but it only draws in the back, not the front. There are no hand pockets where you would normally find "warming" pockets on your parka, nor are there openings to allow entry into your parka pockets. The chest pockets are very large and the upper arm pockets are a nice addition. The Velcro wrist closures are very heavy duty, wide and offer a lot of adjustment. The hood is sized to cover a helmet, but can be adjusted smaller with a rear adjuster and elastic around the front opening. All zipper pulls have large assist straps to allow their use with gloves. The bottom of the jacket has an elastic adjuster to pull the jacket in close around your upper legs. Very impressed! The camouflage is one of the best ever devised; it works. The cut of these is perfect for what its designed to do, go over your insulation layers. It won't restrict the lofting of your puff jackets, or insulated trousers. Nor hinder movement. Exactly what you want from an over smock and trousers camouflage outer layer. It breaths, so not another plastic moisture barrier. Working in the cold is all about moisture management and getting it away from the skin, and out and away. These are really for when cold and dry, not for the wet and mushy. Its not even a full windproof either, but it is pretty quiet. But if you are hoping for some tight fitting slinky ski wear then you are going to be disappointed. My son has my first order as he is taller than me, as I went with "go bigger". New order is one size down so go for what the the label suggests. Shoulder size are correct, as they are generous everywhere to go over high loft insulation, which includes arms and legs. They aren't slim look, and you can't make it so by ordering smaller. I ordered a bolt of the cloth for making my own slim fit suit up as I like the cammo so much. For those sunny hot days to work in, when running too hot for all the layers, as found at high altitude snow but hot. These aren't cut anything other than baggy; which is the whole point and correct for what they are for, to cover a fully insulated Michelin man. Quality is great; price respectful. Hood to go over big hat, or helmet. Pockets big enough to take big gloves/mittens, what you need. All in all, great product if quite specialised. If you live where its big time cold and have big time snow these are the biz. Its what Father Christmas wears when he doesn't want to be spotted; must work as he is only seen at Christmas. Yetis have had them for years, have you seen one lately? Got this in today after debating for a long time whether or not to get it and I'm so happy i did! This jacket is amazing! Fits well and can be adjusted to go over a lot of layers of clothing. Love it. So, having bought a fair few things from Varusteleka, and being in need of a winter jacket to replacing an ailing Canadian forces one my father passed down to me, I decided to take a bit of a gamble and buy this one. I've bought winter gear elsewhere online before and often it looks the part, but either doesn't keep you very warm, or falls apart rather quickly. I am happy to say this jacket does not have this problem. It is well-made, sturdy, and has adjustments that are very simple to operate to get the jacket to fit well on its wearer. 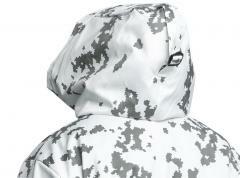 The fabric seems very durable and has stood up to plenty of hiking through the snow already. I'm no expert on camouflage but the pattern here seems to work quite well in the snow. Most importantly for the Canadian winter, the jacket is very wind-resistant - it's often letting the wind through that is the death kneel of other 'winter' jackets I've bought in the past. 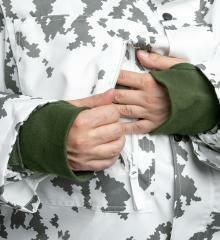 There is an adjustable closing at the bottom to keep the jacket close to torso, and closings around the wrists as well. The pockets are not only large, but positioned in such a way it's easy to access them with the opposing hand. My one (very minor) complaint is that the closures for the wrists tended to rest a little high on my wrist and tended to keep slipping off my gloves. With a proper longer gauntlet mitt or longer gloves, this probably wouldn't be an issue. That's ... basically my only complaint though, and I would easily say this is the best winter jacket I've owned and I'd heartily recommend it to anyone else I know that is looking for a jacket. Loving this winter jacket. Bought it to replace old Canadian Army Winter whites and this is by far an upgrade. When I was serving it always bothered me that it was plain white, which only works in environments that only have snow, and nothing else like the Arctic. This Finnish design works well in boreal forest and other winter climates as you blend in more with a broken up silhouette. Bought the pants and gloves as well as neck tube and watch cap, so yes, I am all in.